What could be easier than bananas and oats? I saw these awesome 2 ingredient cookies here and could not wait to try them out. 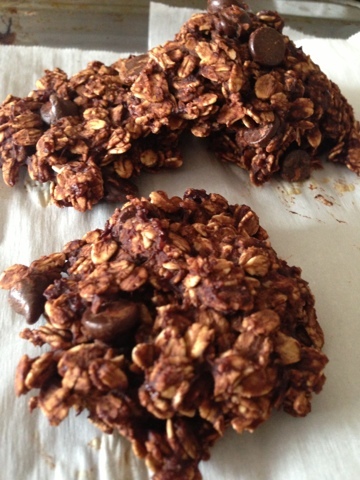 We also added chocolate chips this time, so these are 3 ingredient cookies. *It said to use quick oats, so I popped some old fashioned oats into the Vita-Mix and pulsed it a bit, until the oats were a bit smaller before we got started. My bananas were ripe, but not over ripe, so I put them in the Vita-Mix to mix them up. 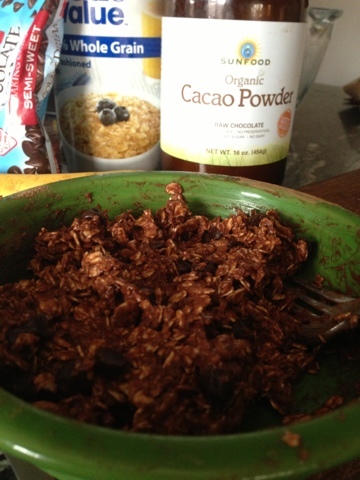 Then I added the "quick" oats to the Vita-Mix and pulsed it a bit more, just to incorporate the two. Then I dumped them into a bowl and continue to mix them up. I added about handful of the old fashioned oats just to get a few bigger chunks in there. Then I threw in a handful or so of chocolate chips. Add a spoonful of dough onto a parchment lined cookie sheet and then bake them for 15 minutes at 350F. They don't flatten out, so how you put them in, is how they come out. I whipped some of these up this morning and added some Cacao Powder (you can also use Cocoa Powder) and they were as good as the original with a bunch of chocolatey goodness.